Although the Higgs boson is of incredible theoretical importance and is responsible for giving known elementary particles their mass, it’s getting far too much credit when it comes to the origins of most of the mass present in ordinary matter. The proton as a relativistic quark-gluon soup. On the subatomic scale, masses of particles are measured in units of MeV (millions of electron volts). The familiar proton weighs in at about 938 MeV. 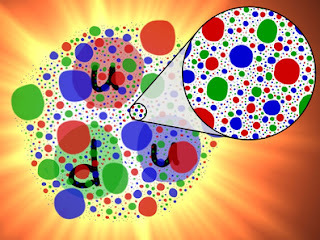 According to the Standard Model, its primary components are 2 up quarks, each with a mass of about 3 MeV, and a single down quark, tipping the scales at about 5 MeV. All totalled, the mass of the 3 quarks in the proton account for around 11 out of 938 MeV of its mass, or on the order of only 1%. Where does all the rest of the mass of the proton come from? It comes from the energy of motion of the three quarks whirling around in their proton enclosure at near the speed of light and from the energy of the gluon field that keeps these quarks tightly bound together. These forms of energy, as Einstein told us, are equivalent to mass. So remember, although the Higgs may have gotten the mass party started, other forms of energy, mostly gluons it turns out, are the other 99%. Checking the Higgs Arithmetic by Marc Merlin is licensed under a Creative Commons Attribution 3.0 Unported License. Based on a work at thoughtsarise.blogspot.com. Thanks for sharing your knowledge. Very much appreciated.